The first ever Pelagic Survey from Kochi, organized by us (CNHS) and Kerala Birder was flagged off from Munambam fishing harbor on 26/02. The one day voyage to survey the sea birds off the coast of Kochi started early in the morning and was inaugurated by Sri.C.G.Natesan, a senior citizen interested in nature and nature conservation. The survey track was recorded by Sri. Toms Augustine, using GPS equipments and the vessel covered a total of 36 nautical miles area into the Arabian sea. like Arctic Skua, Pomarine Skua winter visitors like the Great Blackheaded Gull, Brownheaded Gull, Heuglins Gull, Crested Tern, Whiskered Tern and Bridled Tern. 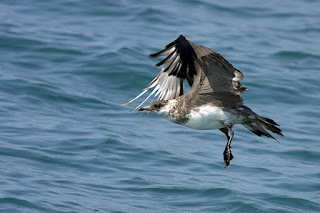 It is reported that very few records were available about the sighting of the Arctic skuas off the coast of Kochi; however, the sightings of the birds in different plumage variations were an experience of a lifetime to the survey team. Twenty one bird watchers and nature photographers, led by Dr. Dr.Dilip K.G., Praveen E S, Ginu George, Sandeep Das, Toms Augustine,Dr.Anudath,Adv.Paul Puthur, Gopal Prasad,Kripesh ,Bijoi ,Pradeep ,Gopinathan Nair,Depalan,Raveendran K C, Sudeep Elamon,Sri Aby ,Sri. Vasanth, myself and youngsters Adil Anudath and Ammini Puthur ,were in the team. Photos were taken by Sri E S Praveen, Sandeep Das, Bijoi KI ,Gopal Prasad and Sudeep Elamon. The sea was relatively calm; climate sunny and hot; not much clouds and fishing vessels were sporadic in the sea compared to our last trip off Chettuva coast.